Graham Anderson has been a musician for nye on thirty years and recording as Shipcote for ten years now and he still has the twinkle in his eye and lyrics; which is a pleasant surprise in this cynical industry. ME & MY BUDDIES is exactly what it says on the tin – Shipcote and a handful of friends thoroughly enjoying themselves playing Folk meets Western Swing in a studio and Paul Worthington’s production is not only pin sharp but manages to portray the warmth associated with a Shipcote gig. Although definitely not the Small Faces hit of the same name;Lazy Sunday evokes the same sentiments; as Shippy tells us about ‘fetching the papers before (maybe) going to Church’ and ‘trying a lazy ramble/by a lazy river/ with magic landscapes/all buttery yellow’ over a lazy guitar, lazy dobro and lazy bass backing. In another life you could picture Bing Crosby singing it. Old is Cool will appeal to those of us who have children that have left the nest. Shipcote lists all of the benefits of having his home back to himself but the lilt in his voice tells another story as he also lists the ailments associated with growing old. I guess that Shippy would deny it; but there’s a simple theme that runs all the way through ME & MY BUDDIES and that’s every song appears to be a love song in one guise or another. Sometimes they are wrapped up in a different cloth but there’s a feeling of a man enjoying every nook and cranny of his life; but he knows that the comfort and joy comes from surrounding himself with family, friends and good music and he celebrates all of that with style and panache. 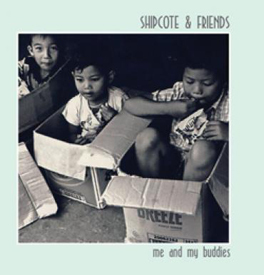 Throughout the album Shipcote is more complimented than supported by Cath Reding on fiddle, piano and accordion, local legend Bryan Younger on guitar, banjo, Dobro and lap steel with John Codd’s upright bass being the glue holding the ship together. If you only listen to one song, I heartily recommend the final track Your Kinda People which encompasses everything that is good about life, love, family and friends and could and should be the theme tune to a gentle BBC comedy show or just your soundtrack to a lovely Summers day.